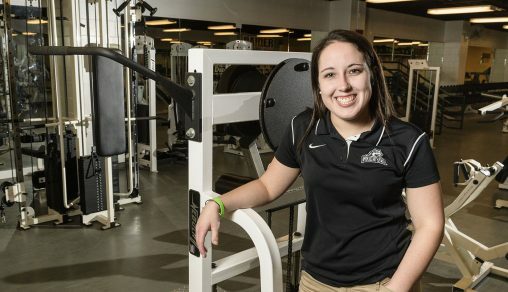 It was a pivotal moment for Howard, who quickly changed her major from biology to sports science with an eye toward physical therapy. A second classroom moment would propel her to an internship and then a job with Maple Tree Cancer Alliance, a nonprofit that provides free exercise, nutritional guidance and fellowship to people battling cancer. The Maple Tree Cancer Alliance was founded in 2010 by Karen Wonders, director of the Wright State University Sports Science Program. At the alliance, Howard went through an extensive training process. After completing a 400-hour internship with the alliance at Soin Medical Center in Beavercreek, she was hired as a full-time employee. Howard said most of her patients see a drastic increase in strength and endurance after only three months of exercising. That coupled with mental and emotional support sends their confidence soaring, she said. Howard said some cancer patients arrive at the exercise program in tears, “defeated” by their situations. Howard grew up in Englewood. Her mother, an alumna of Wright State, is a teacher in the Northmont school district. At Northmont High School, Howard was voted “Most Involved.” She played soccer all four years and was active in Students Against Destructive Decisions and a host of other organizations. Katelyn Howard has given campus tours and served on the College of Education and Human Services Dean’s Student Advisory Board, the Wright State chapter of Habitat for Humanity and the ’67 Society. After graduating in 2015, Howard enrolled at Wright State in part because she felt she would have opportunities to take on leadership roles. At Wright State, Howard played co-ed basketball and other intramural sports. She was also a campus tour guide for two years. “Acting as the face and voice of the university was a really great experience,” she said. Howard is an honors student, with a grade point average north of 3.8. She is also president of the College of Education and Human Services Dean’s Student Advisory Board, president of the campus chapter of Habitat for Humanity and director of philanthropy for the ’67 Society. Majoring in sports science gave Howard hands-on experience and led to internships. Howard also spent a lot of time at the Wright State Physicians Building, where many athletic training classes are held. And she conducts research into arthritis of the knees, exploring how exercise can improve range of motion. 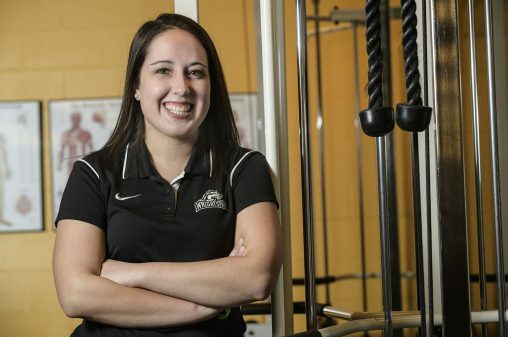 After graduating this May, Howard plans to pursue her doctorate in physical therapy at the University of Dayton.